Having faced serious personal challenges Ellie was able to set a new course. 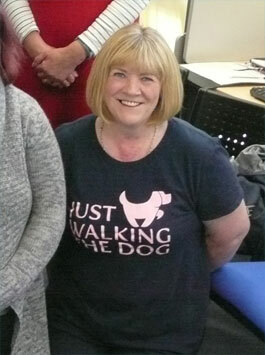 Through engaging with our ETHOS project she determined her own future pathway into setting up a dog walking business. ETHOS provided her with the knowledge, advice and guidance required to set this up. Originally, she had a grand idea of providing a grooming service which required a greater outlay. After discussing everything, she set about starting the business at a simple level and offering a dog walking service. With help and support in terms of being fully prepared (business plan, action plan, risk assessments, equipment, systems and processes) she launched the business. Does the ETHOS help and support stop there? In terms of our remit, yes it does but in terms of building her self-confidence and self-esteem, it doesn’t. Once launched, the need for some level of continued support and a simple helping hand is still required. Ellie’s business, Bounding Buddies, is flourishing and goes from strength to strength and who knows, the addition of a grooming service may not be too far round the corner!